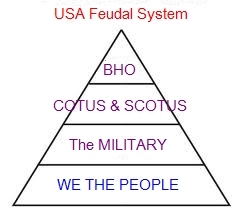 “The feudal system was a way of government based on obligations between the lord or king and vassal. The king gave large estates to his friends and relatives. These estates known as the fief included houses, barns, tools, animals, and serfs or peasants. The king also promised to protect the vassal on the field or in the courts. In return the nobles who were granted the fiefs swore an oath of loyalty to the king. The nobles promised never to fight against the king. They also had to give the king whatever he asked for. The king may ask for men to fight a war, money, or advice. The nobles also gave the king a place to stay when he traveled. Each of the king’s vassals was also a lord or tenant in chief with vassals of his own. Each vassal would be an overlord to those he granted fiefs while remaining a vassal of the king. The subtenants in turn subdivided the land. Sometimes there were many levels of lords who had vassals under them. The most important promise of the vassal to the lord was the military. The vassal usually served as a knight. This service lasted about 40 to 60 days a year. If they actually had to fight in a war they usually did so for two months. If there was no war the knights did 40 days of training at the castle. 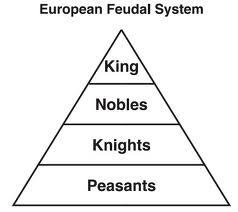 There were only a few nobles. Most people, approximately nine-tenths, were serfs who worked the land for a noble. The serf was bound to the land. If the noble sold the land the serf went with it. This was not much better than being a slave. A peasant village had between ten to sixty families. Each family lived in a hut made out of wood or straw. The floor was covered with straw or reeds. Beds were made from a pile of dried leaves or straw. Animal skins were used as blankets. A cooking fire burned in the middle of the hut with the smoke escaping through a hole in the roof. Furnishings included a plank table, a few stools, and a chest. Each hut had its own vegetable garden. About half the serfs time was spent working for the lord. Jobs included working in the fields, cutting wood, hauling water, spinning and weaving, repairing buildings, and waiting on the members of the lord’s family. Peasant men were even expected to fight in times of war. Besides all the work peasants had to pay taxes to their lord. This was usually given in wheat, lamb, chicken, and other animals. There were also some freemen peasants. These people were usually in a trade. These people were not bound to the land. They paid a fixed rent to the lord. The freemen had more legal rights than the serfs and fewer duties to the lord. In actuality there was little real difference between the freemen peasants and the serfs. How was your holiday season last year? What do you expect this holiday season? They have an agenda until they are shown the Congressional doors. As it is now, they sit on their haunches ready to spring at their Bogus POTUS master’s edicts. Remember last year in November and December? Never forget how they sucked the fun out of the happiest time of the year for Patriots. Turnabout is fair play! After all, it’s our time to give them a present that keeps on giving… them grief! 2010 begins the end of modern day tyranny!!! Okay… so the Liberal Progressive Socialistic Democrats and Media – have attempted to paint honest people of all races, creeds, job titles, education levels or The Liberal Progressive Socialistic “social standards” – who attend and support the Tea Party Movement – opposition to higher taxes and health care takeover – as racists and other false terms. These lies, too, are now exposed. Hmm… the polls show it, the voices in the TEA Party events display it, yet the Lame Stream Media and the Liberal Progressive Socialistic Democrats distort the bi-partisan to multi-partisan TEA Party Movement. It’s all good though! The more you try to squash us with idle staged events, lunatic salted paid disruptors, and lies like your Bogus POTUS, the more we grow. 2010 Clowns Out of Every Town. The latest mark of hero-dom are Doctors ( Military & Civilian ). One gentleman is both and I wrote a piece about him “Army Lt. Col. Terrence Lakin – Patriot and Physician Refuses All Military Orders“. For his patriotism though, the Army wants to examine him? “Eligibility challenger: Don’t touch my brain!“. Sure… a little sedation, oops, a little test, oops… Lt. Colonel Terrence Lakin is a brave and intelligent man. And he is not alone in the request for the Bogus POTUS to reveal his valid documentation for examination and verification. The other current Doctor Hero is Dr. Jack Cassell, a urologist, who is opposed to the health care takeover and tells Obama supporters by a sign ““If you voted for Obama … seek urologic care elsewhere. Changes to your healthcare begin right now, not in four years.” He rocks and rules his own business in Florida and has the authority to do so. Whine all you like about it http://www.mycongressmanisnuts.com/! They both adhere to the “Hippocratic Oath”. The AMA did not, and does not speak for a majority of Physicians, Physician Assistants, RNs, LPNs, Optometrists, Dentists, Interns and a variety of specialists but presented itself to America as such. By the way AMA you will be thrown under the Obama bus. It’s only a short time away. These Doctors/Physicians are well aware of their U.S. Constitutional rights. God Bless America! 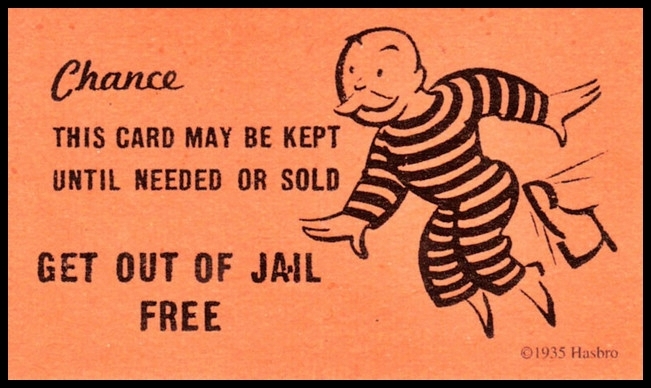 I would definitely carry a card saying that I didn’t vote for Obama. I seek out Conservative stores and store owners to make my purchases! This whole scam by the administration reminds me of the stimulus jobs when I asked many, “Do you know anyone laid off, or job closed down? Now do you know anyone with one of those fancy new stimulus jobs?” The 1st question always had numerous affirmatives, the 2nd question always…crickets. Now updating the questions……….. “Do you know anyone who freely supported the Health Care takeover other than your elected officials for their own deals and bribes? Did you go to an after the Health Care takeover vote party to savor the scourging of America?” Bet crickets on both! If you are not familiar with Massachusetts Senator Scott Brown you can be brought up to speed by reading my previous blog entry The 41st Conservative Senate Vote Must Be Pursued and Won. He’s on target to become the first Republican U.S. Senator for Massachusetts in 30 years. And that just a couple of us gals gabbing, check out this Twitter Search Stream for Scott Brown for up to the minute information! And Gateway Pundit added some excitement with his article ‘Conservative Republican & “America’s Sexiest Man” Contest Winner Gains Momentum in Massachusetts Senate Race‘ this morning. He’s a modern man in all respects! Tagged brown, for, massachusetts, modern, scott, senator, state, u.s.